Head coach Paul Goriss and new staff member Bec Goddard. Photo: Supplied by UC Capitals. 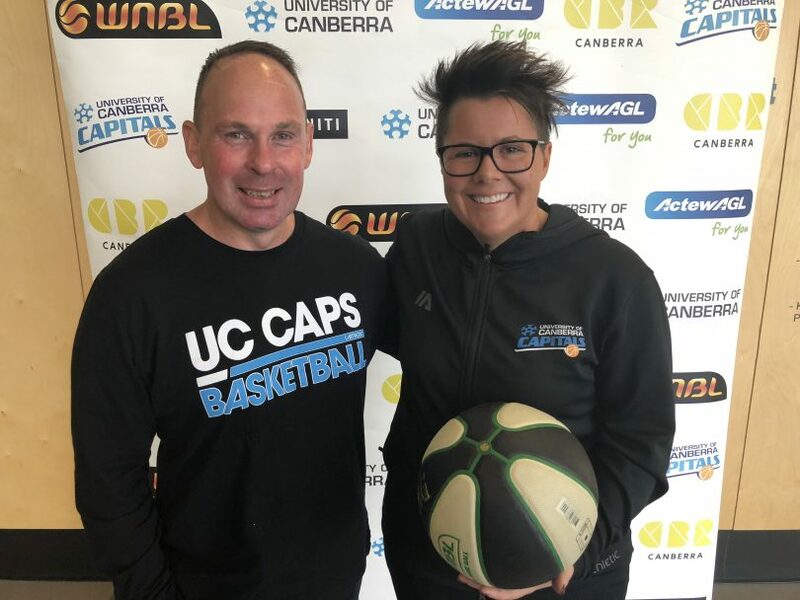 The UC Capitals are pulling out all stops to return to WNBL finals and have added former AFLW premiership coach Bec Goddard to their staff for the 2018–19 WNBL season. Goddard was unveiled as part of the Capitals’ coaching staff on Thursday morning (4 October) after the former Adelaide Crows coach agreed to swap sports and try her hand at basketball. Goddard, who lead the Crows to the inaugural AFLW premiership in 2017 will be charged with transforming the club’s matchday preparations and will also assist with player reviews and attend training sessions and home games alongside the other coaches. Goddard said it was an honour to join the Capitals – a club which she believes has led the way in women’s sport for many years. “Paul Goriss is leading the club into a new era and has laid strong foundations from which to build. There’s a fantastic learning environment here and Paul’s passion for coaching is as strong as I’ve seen,” she said. Canberra born and bred, Goddard boasts a long and decorated history in Australian rules football and is a proven performer in high-performance sporting environments. As a player, she won back-to-back ACTWAFL titles with Eastlake in 2002 and 2003 and tasted success in the WVFL with the University of Melbourne in 2005. Goddard began her transition to coaching in 2008, acting as a player-coach at the Gungahlin Jets. She has coached various teams in men’s and women’s leagues across Australia. Goddard moved to Adelaide in 2016 for a coaching position at SANFL club the Woodville-West Torrens Eagles. The role preceded her appointment and subsequent success with the Crows in 2017. UC Capitals head coach Paul Goriss said Goddard’s experience and success in high-performance environments would add another dimension to the UC Capitals. “I am excited to have someone of Bec’s calibre on our staff,” Goriss said. “She brings a point of difference from another sport. Her knowledge, leadership and success in high-performance environments will be invaluable to us. Goddard returned to Canberra from Adelaide earlier this year to continue her duties with the Australian Federal Police and took up an assistant coaching role with the Canberra Demons on their way to a first finals appearance and first finals win.